What the hell is going on in Idaho? “There isn’t much violent crime in Preston – but how much does it take?” Chief Geddes responded. “There wasn’t much crime in that little Connecticut town [Newton] before Sandy Hook – but it would have been nice if they would have had an MRAP on the day of the school shooting.” He also took issue with the assumption that because Preston is small and relatively tranquil, his department doesn’t need to expand its paramilitary capacity: “Boise has a much larger population, and much larger police force, and much greater capacity than we do – but are we to believe that the people in Boise are more valuable than the people in Preston?” This assessment of relative value omits rational calculations of risk. It also assumes that enhancing police capacity conduces to public safety, which is at very best a thoroughly questionable assumption. 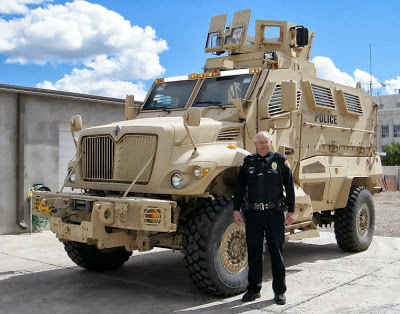 Although the advertised law enforcement purpose served by MRAPs and other armored vehicles is force protection, Chief Geddes suggests that the vehicle could also be used to evacuate citizens who are threatened by an active shooter. That claim is robustly implausible: There isn’t a recorded instance in which a SWAT team responding to an active shooter made anything other than “officer safety” its chief operational priority, and Preston isn’t likely to set a precedent – assuming that such a situation were ever to arise in that bucolic southeastern Idaho town. Chief Geddes points out that his department and the Franklin County Sheriff’s Office (which is headquartered in Preston) are receiving training and assistance from “a military agency” regarding the operation and maintenance of the MRAP. This blending of functions and equipment summons concerns about law enforcement militarization that the Chief quickly and impatiently dismisses. “General Colin Powell’s Doctrine of the U.S. Armed Forces is that the United States should be the `meanest dog in town’ to frighten a potential enemy,” wrote career law enforcement officer –and SWAT instructor — Edward Leach in the October 2001 issue of Police Chief magazine. “When force is used, it should be with `overwhelming strength and no half-way measures.’ In law enforcement, these principles are routinely applied in both field and tactical operations. … Law enforcement [application] of the Powell Doctrine is clear: have overwhelming and superior resources available, primarily as a deterrent, but use them decisively when needed.” Leach, who until a year ago was Undersheriff of Idaho’s Kootenai County, unabashedly depicted police as a military occupation force. He doubtless understands the message being sent when police in a town the size of Preston acquire a combat-grade armored vehicle. So should we. While visiting the elite Battle Command Training Program at Fort Leavenworth, “I head discussion of the Posse Comitatus Act, which forbids the National Guard to act as a local police force,” reported Robert D. Kaplan in his 1996 book An Empire Wilderness. “The implication was that turbulence within the United States might one day require the act to be repealed.” During a discussion of the use of the military to suppress domestic terrorism, a Marine major declared: “The minute I heard about Oklahoma City, I knew who did it – rednecks, the kind of guys from southern Idaho.” That officer went on to predict that owing to the presence of such turbulent people “`a time may come when the military will have to go domestic,’” Kaplan related. [...] The amendment containing this enhancement of the Guard’s mission, significantly, would be inserted just above an existing provision allowing county sheriffs to enlist the aid of the Guard to deal with “any breach of the peace, tumult, riot, resistance to process of this state, or a state of extreme emergency, or imminent danger thereof….” Translated into practical terms, this would allow any of the state’s 44 sheriffs to seek the assistance of the National Guard any time they anticipate resistance to a forfeiture action. After all, everybody in Idaho has guns, a fact that has been invoked by police officials across the state to justify the acquisition of combat-grade armored vehicles from the Pentagon. This means that any time law enforcement sets out to steal somebody’s property through “asset forfeiture” – something that was recently done as part of a federal investigation into “illegal” card games at a private residence – there is “imminent danger” of armed resistance. Republican state representative Linden Bateman of Idaho Falls (which, for the record, is in southern Idaho) told the Idaho Reporter that “There seemed to be no major opposition to this bill” in the Legislature. Gov. Butch Otter has reportedly read and approved the draft measure. No objections have been heard from Idaho’s “constitutional sheriffs” – the officials who resolved to oppose new federal gun restrictions, but whose independence is neutralized by their dependency on federally supported asset forfeiture. Problems? This is a hell of a lot more than ‘problems.’ What troubles me was the unanimous voice vote on this and the politicos saying they saw no problem with it. This beast will be back, count on it. Idaho, you are not out of the woods on this. 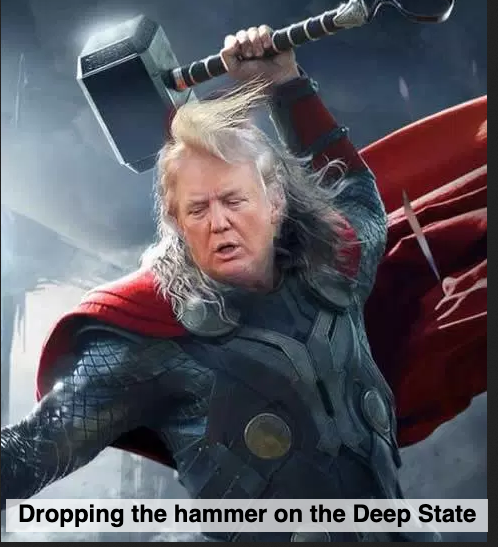 You are being targeted by jack booted Progressives. ***Whereas the Posse Comitatus Act does not technically cover the National Guard, that was modified in 1981 amidst great outcry, I might add… this does go directly towards the militarization of police and the vast expansion and use of the National Guard. The National Guard was meant to help in times of emergency, not act as a civilian military force at the beck and call of politicians who are more than willing to violate our constitutional rights. There have been numerous violations of Posse Comitatus over the last few years and in my opinion, furthering the deployment of the National Guard other than for legitimate emergencies is a violation of our rights.